This entry was posted on March 21, 2019 by Zoe Thomas. Taking a moment away from your screen to relax your eyes and stretch your body is something we've recommended to our clients for years. We were recently approached by a BBC journalist to offer our thoughts on how microbreaks can be used to reduce the risk of musculoskeletal disorders. 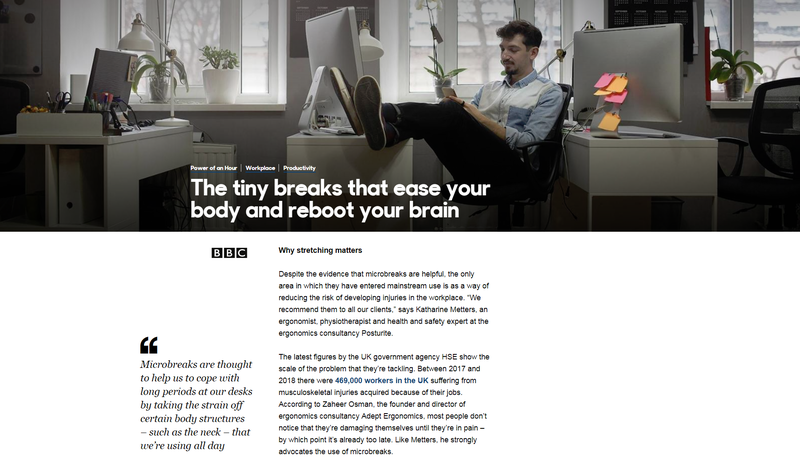 The resulting piece on the BBC Capital website is an interesting and well-researched investigation into all the different ways short, regular breaks might be able to help. There is evidence to suggest that taking a short break from work - whether to stretch, take a walk, or even just check phone messages and social media, can help with things like concentration, stress relief and performance. One theory is that taking a microbreak kick-starts a process called psychological detachment, which occurs when you mentally disengage from work tasks to let your brain recover. The BBC article cites one study by Andrew Bennett, a social scientist, who studied microbreaks for his doctoral thesis while attending Virginia Commonwealth University. He found that participants who took a microbreak from work by watching a funny video clip felt invigorated and more attentive afterwards, with lower fatigue and shorter delays in response times during a cognitive test. Even beyond clinical trials, most of us know from experience that concentrating for long periods on a single task can be not only difficult, but also rather unpleasant. It takes mental energy to focus our minds. We're curious creatures in need of constant stimulation. In school we learn that cramming before an exam is counterproductive. We are supposed to absorb information in bite-sized chunks and return to it at a later date, once it's had time to sink in. Our Lead Consultant Katharine Metters recommends using your microbreaks to do something active, rather than scrolling through your phone - which of course comes with its own musculoskeletal risks. Go for a two-minute walk around the building. Find a reason to pop to your car and back; go to a toilet on a different floor; make everyone a cup of tea. The key to getting the most out of microbreaks is to keep them short and regular. Don't spend ages chatting to your colleagues in a different department, but don't be afraid to stop for a few minutes either. Don't be afraid of what people think. Presenteeism - appearing to work without being productive, is a huge drain on many organisations. Mentally demanding and repetitive jobs require regular breaks. If you feel your concentration slipping and you find yourself clicking around on your computer pretending to do something important to avoid arousing suspicion, you know it's time to get up for a stretch and a walk. Think of yourself as a battery. You need to put yourself on charge or you'll simply run out. Some scientists believe that microbreaks are more effective when they are spent doing something the individual enjoys. Where possible, individuals should be given the freedom to decide when they need to take a break, and what they do with that time. Our bodies are all different, our emotions and state of mind are all different. Perhaps you prefer to simply take a stretch and check your personal email every once in a while, or perhaps you'd rather go for a brisk walk, or do some yoga in a toilet cubicle. The key for employers is to be vocal about the benefits of microbreaks. Make sure everyone knows they can stand up whenever they need to, as long as microbreaks are just that - micro. Our WorkRite Agile e-learning course trains workers in all environments about healthy working behaviours, including active working, posture, set-up and taking suitable breaks.